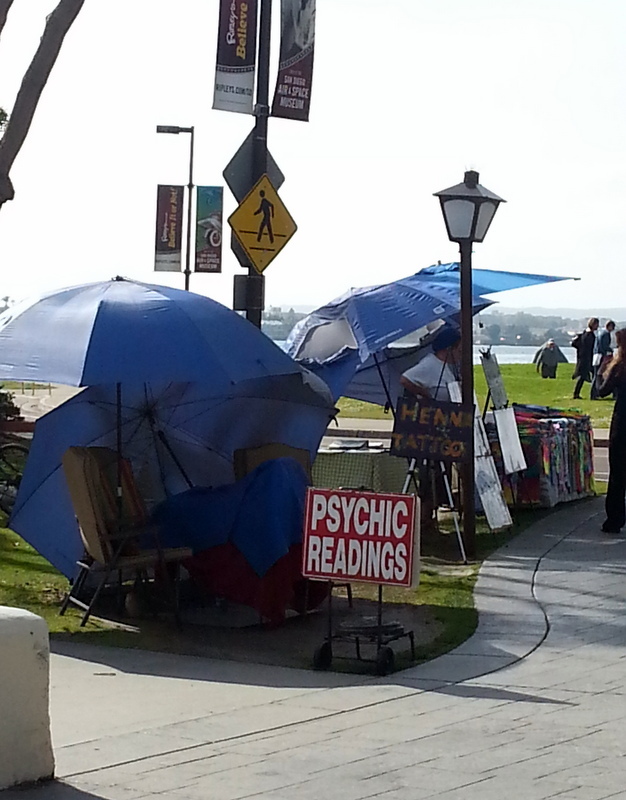 One last day in San Diego. We chose to cycle into the city to check out the shoreline, and see whatever sights we could see from our bike saddles. There are many. San Diego is a city for cyclists. We obtained a free bicycling map, showing trails, streets with dedicated bike lanes, designated bicycle corridors, and other streets labeled as bicycle-friendly. Stopping to consult it frequently, we were able to navigate around quite easily, with one notable exception which wound up with us riding for a short distance on this street. I do NOT recommend this! 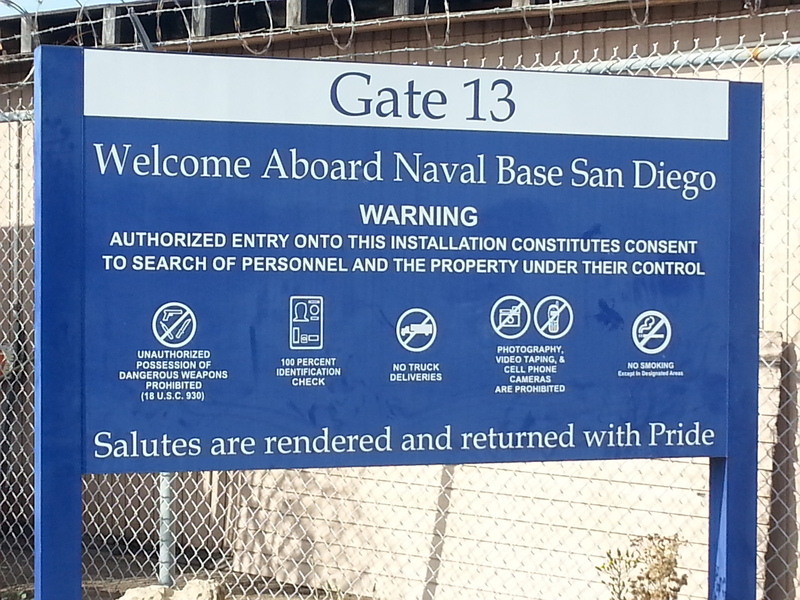 We cycled along Harbor Drive, where an incredible array of naval vessels are harbored. Using the ID numbers on the side, we tried to identify some of them, but came up with so many conflicting ids, we gave up. 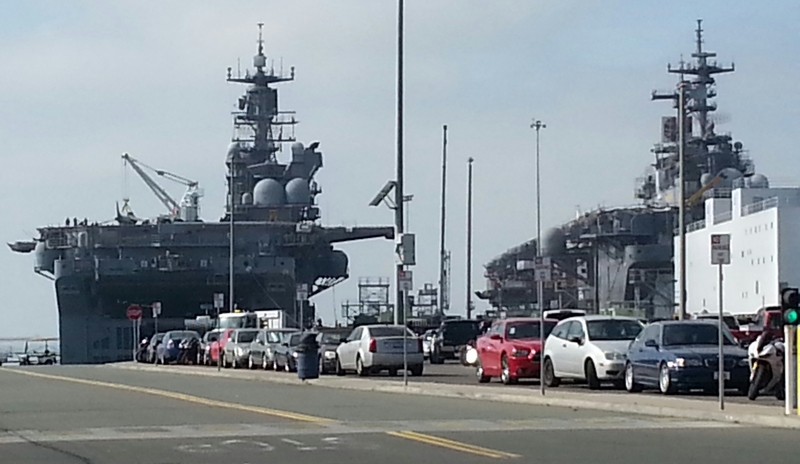 (note the airplane at the base of the crane on the aircraft carrier on the left). The ship was mammoth! 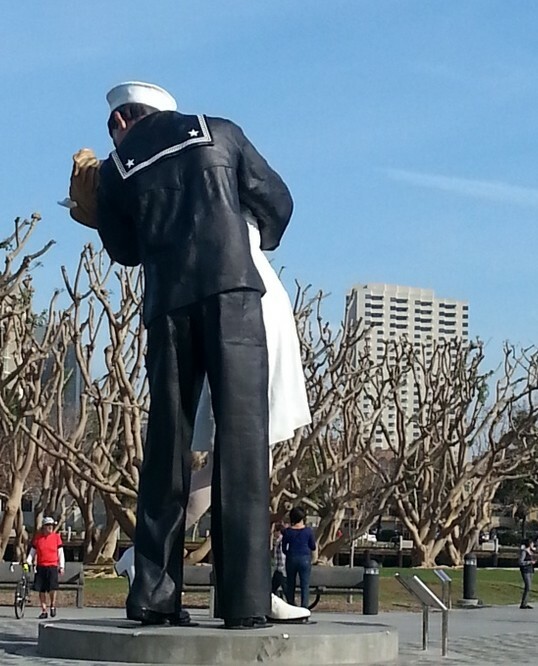 We do think we saw the aircraft carrier Ronald Reagan, and we did see the USS Midway (aircraft carrier), which is now a maritime museum. 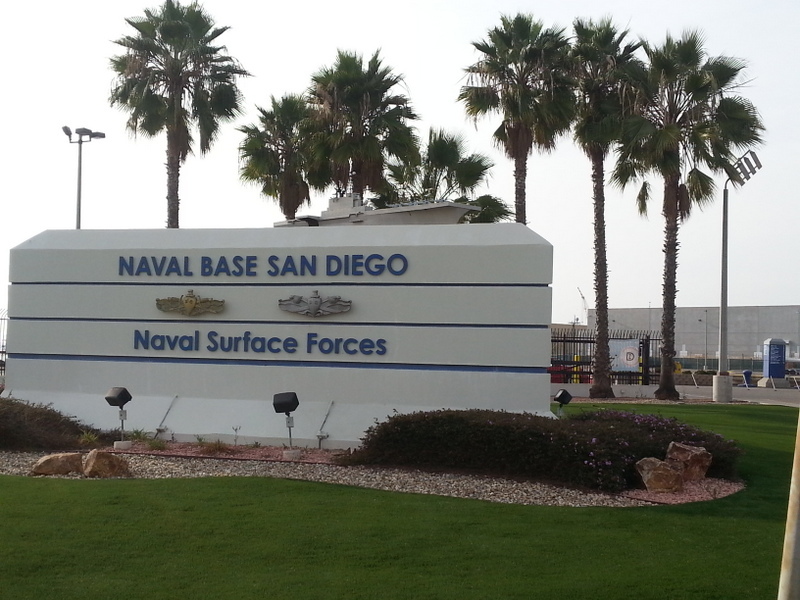 The overwhelming US Navy presence in this area quite remarkable. There’s also the ‘regular’ seaport fare. Pineapples, I presume. We wandered back and forth, around and around, checking out the sights. Huge yachts are anchored in the marinas. We watched a guy give his dog a drink right from the people’s water fountain. The dog was slurping up water like it was parched, while his owner proudly snapped photos of this feat on his cell phone. Nasty! Glad I wasn’t next in line. The waterfront area was vibrant, and we thoroughly enjoyed gawking at everything as we passed thru. 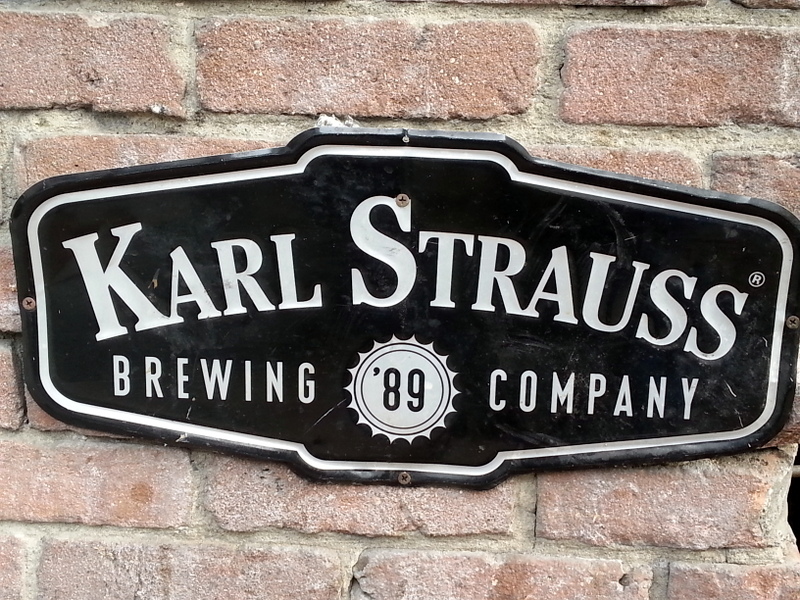 Thru to the Karl Strauss Brewpub, that is. Lunch and chilled pints of IPA. Cycling has its rewards. Onward. 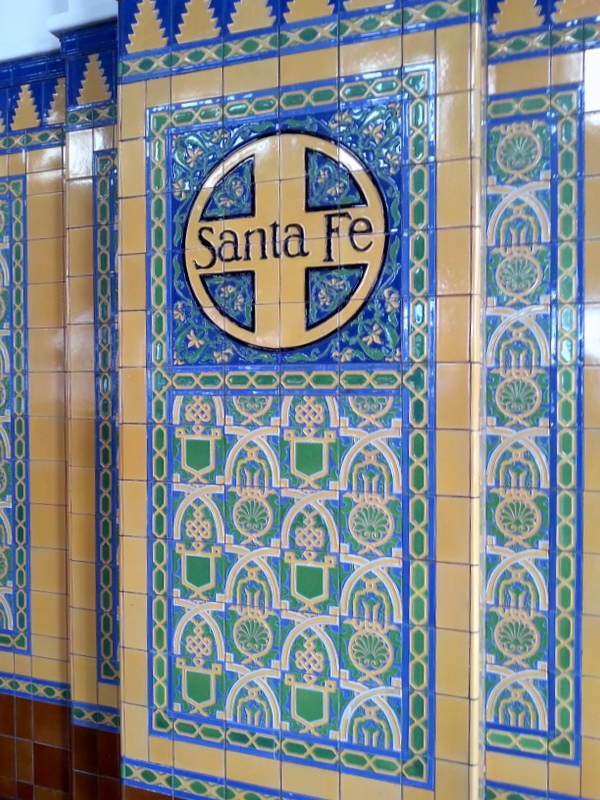 We passed the old Santa Fe Train station, still in use today. 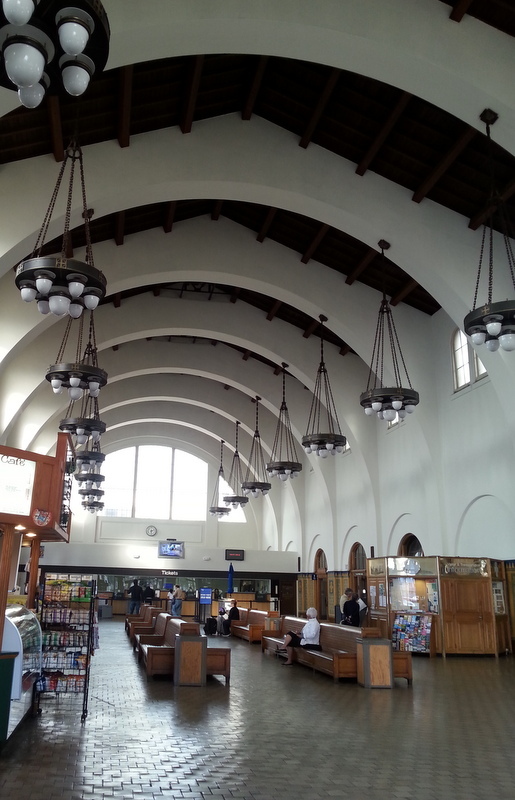 It was built in 1912, I believe, and the structure and interior (I was told) are all original. San Diego has a red trolley line which passes through several points in the city. It seems to take the place of bus service within the city, as we didn’t notice any of them. 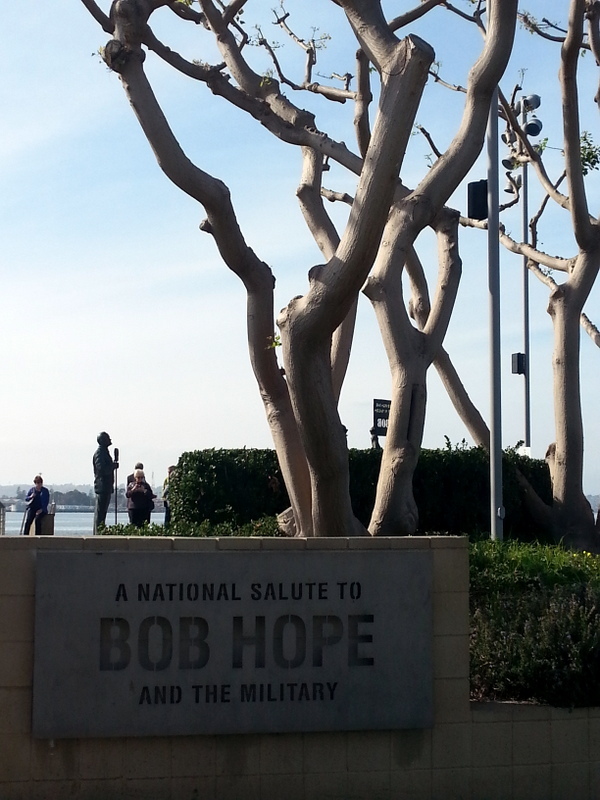 and a scupture tribute to Bob Hope for his contribution to the USO. 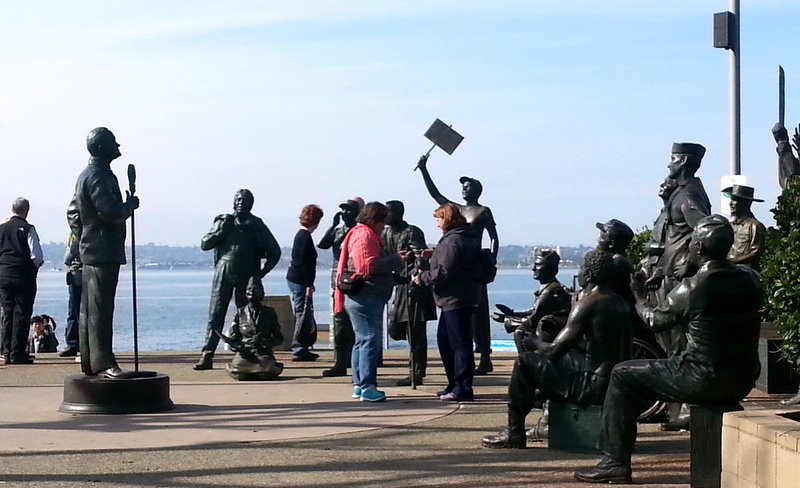 Sculptures of servicemen listening with big grins and applauding surround Hope. Broadcasts of some of the actual shows are heard continuously in the area. It’s a moving tribute to a performer who gave so much of his time and energy to the US Armed Forces. We’ve barely scratched the surface of this amazing area, yet we’re moving on tomorrow. This entry was posted in California, camping, cycling, retirement, simple camping, T@DA and tagged California, camping, cycling, historic sites, retirement, road trip, simple camping, T@DA by Judy Crankshaw. Bookmark the permalink. Your lot has always looked like an Estate to me!. We wondered if you were caught in all the Houston ice mess. Noticed that what MI weathercasters call “wintry mix” was called “messy mix” on Weatherbug.com. That made me laugh. Did you go to Galveston Island again? The zoo (from your last post) looked like a great place to spend a day, but I would love to tour an aircraft carrier. One of these days I may have to break down and buy a bike, it sounds like a fun way to get around while travelling. We just didn’t budget a day for the aircraft carrier. Seems like it would take that much time. If we were staying for one more day, I would definitely do it. As for sight-seeing by bike, it’s a very low-stress way to get around. No hassle of finding parking places, and you can ( almost) always get right up to where you want to go. All good.